Binds to the 40S ribosome and promotes the binding of methionyl-tRNAi and mRNA. This subunit binds to the 18S rRNA. Synthetic peptide corresponding to Human eIF3g aa 1-245 (N terminal). Our Abpromise guarantee covers the use of ab37685 in the following tested applications. WB 1/500. Predicted molecular weight: 35 kDa. Component of the eukaryotic translation initiation factor 3 (eIF-3) complex, which is required for several steps in the initiation of protein synthesis. The eIF-3 complex associates with the 40S ribosome and facilitates the recruitment of eIF-1, eIF-1A, eIF-2:GTP:methionyl-tRNAi and eIF-5 to form the 43S preinitiation complex (43S PIC). 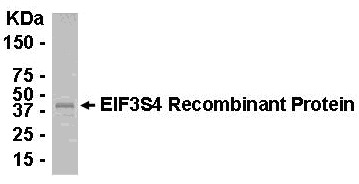 The eIF-3 complex stimulates mRNA recruitment to the 43S PIC and scanning of the mRNA for AUG recognition. The eIF-3 complex is also required for disassembly and recycling of post-termination ribosomal complexes and subsequently prevents premature joining of the 40S and 60S ribosomal subunits prior to initiation. This subunit can bind 18S rRNA. Belongs to the eIF-3 subunit G family. Phosphorylated. Phosphorylation is enhanced upon serum stimulation. Cytoplasm. Nucleus. Cytoplasm > perinuclear region. Colocalizes with AIFM1 in the nucleus and perinuclear region. An E coli-derived fusion protein was used as test antigen. Affinity-purified IgY dilution: 1:2000, Goat anti-IgY-HRP dilution: 1:1000. Colorimetric method for signal development. ab37685 has not yet been referenced specifically in any publications. Publishing research using ab37685? Please let us know so that we can cite the reference in this datasheet. There are currently no Customer reviews or Questions for ab37685.